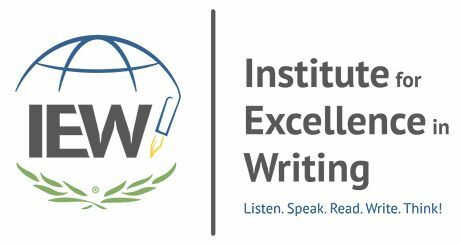 When I found out we were getting to review Teaching Writing: Structure and Style, and Student Writing Intensive Level A for the Institute for Excellence in Writing (IEW) I honestly jumped up and down and did my happy homeschool mom dance! (Sorry, no videos!) I have heard such fantastic things about this program, but I wasn't sure if it would be autism appropriate, so I never had the chance to try it out. For those who may not know, Teaching Writing: Structure and Style, and Student Writing Intensive Level A deluxe package is a GREAT DVD based program by Andrew Pudewa that not only teaches your child the mechanics of the writing process, but also teaches you how to teach your child! Teaching Writing: Structure and Style is a 12 DVD seminar that comes with a binder full of the TWSS practicum workbook teaching goodies. TWSS is great for helping YOU teach your child so you both master the art of writing! Student Writing Intensive A is a first level writing program designed for kids in the 3rd-5th grade range. This program is a great tool that breaks down the writing process into smaller pieces so that your student can master writing in a logical, and easy to follow manner. For this review: We received the Teaching Writing/Student Writing Value Package Level A ($249.00 as of the writing of this blog.) In this package we received the 12 seminar DVD and practicum workbook, 5 student DVDs and Student Notebook with handouts and lesson plan suggestions, and 1 year premium online access. This is a very large package! I wanted to follow the lesson plan exactly as it is written, but found I needed to move a little slower with Mr. B. Up until this point, I had tried nearly everything to help him write, and nothing worked. I was cautiously optimistic about IEW. I popped in the first DVD, and sat back in shock! Over the course this year, I have discovered Mr. B responds really well to DVD style programs, and this one is no different. At the beginning, Andrew Pudewa instructs his students to use a code system for raising their hand, this is one of my son's favorite things about this program HAHA! He is always holding his hand up now with the appropriate number of fingers! So at that moment I knew he would take to this program. As I stated before, we have moved a little slower. For example, the first lesson is about key words, and rewriting paragraphs using these key words, and combining sentences with the word "which." It sounds like a lot of information, but the way Mr. Pudewa breaks it down, it is very simple to understand. We spent the first lesson going over the handout along with the video. The following days you are to do the same lesson on your own using different handouts. We did this, but we had to go back to the video a few times for repetition. We also extended the lessons beyond the handouts, and I had him underlining the keywords in other school work, and orally reworking the paragraphs, then orally narrating back to me. For the first time ever, Mr. B wrote a paragraph on his own!!!!!!!!!!! First there are handouts. 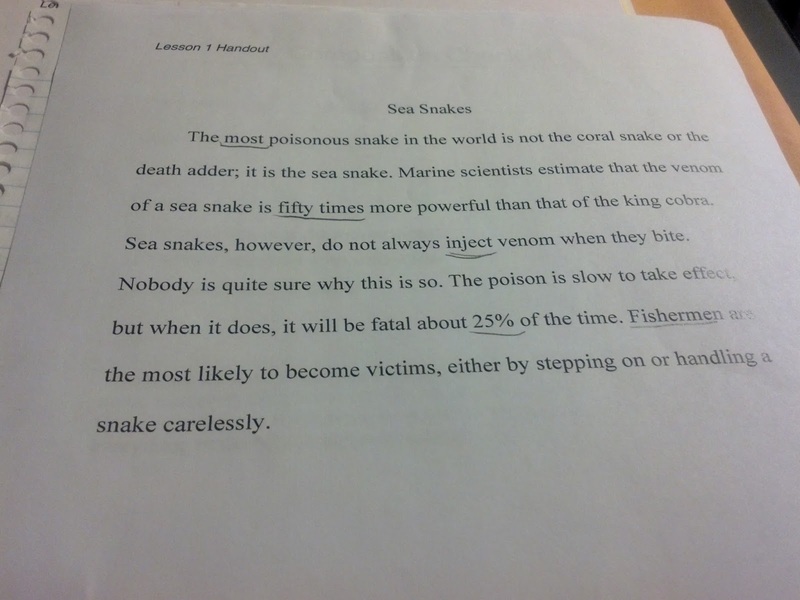 This particular handout provides a two for one lesson. Not only did we tackle writing style and structure, but we also got to learn about Sea Snakes! This led to all sorts of discussion and creative learning. As you can see, I took this photo in the middle of his work. Here he was to underline three key words in each sentence that would help him to remember what that sentence was about. The DVD is FANTASTIC about going over this and explaining what words are key words. He caught on to this fairly quickly, but we did have to go back to the DVD lesson a few times due to the nature of his special needs. That's the great thing about the DVD, you can go back to it as many times as you need! As they underline the words, they are to make a list of the words. Neatness doesn't matter here, as it is just a brainstorming type of work. So long as the child can read it, that's the important thing. The DVD goes over the first 5 lines, and the child is on his/her own for the 6th. Mr. B was pretty nervous he had gotten it wrong (meaning no one else on the DVD chose his specific 3 words) so he was pretty excited when one child on the DVD said the exact same 3 words Mr. B chose, and Mr. Pudewa said good job! To Mr. B, he was bragging specifically on him! This is the back of the handout. 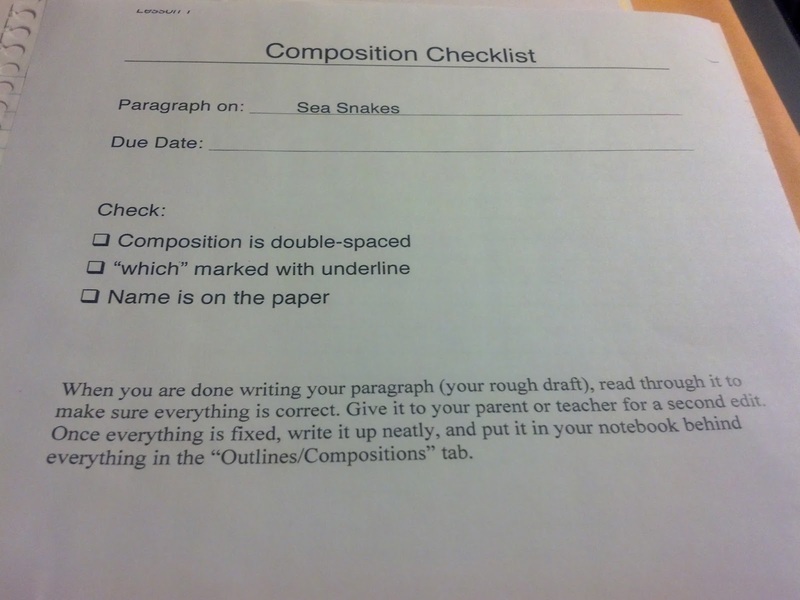 It's a check list to make sure they have everything correct with their paper. After you make up your keyword list, you have to make up sentences for each, and then combine some sentences with a "which " clause. The child has to write a rough draft, then a very neat, with no mistakes, final draft. There is a specific structure to the papers, as shown by this photo, and this is great for Autism/Asperger's due to the routine nature. They don't have to wonder if their set up is correct because it is the same set up each time. They must use ink pens only, leave a line between each sentence, and make all corrections in the free space. Another really great aspect of this program is the editing skills your child develops. They will learn editing shorthand/symbols and the mechanics of proofreading while going from their rough draft to their final drafts. This is the first program I've seen that truly teaches the entire writing process. This isn't just freewriting or prompts. This is reading about something, picking out the note taking keywords, rewriting the information into their own words (more or less) editing a rough draft, and then finally producing a final draft of their own work. Does Teaching Writing: Structure and Style, and Student Writing Intensive Level A Pass My 4 Ingredient Test? There is a schedule provided that really does provide the best results. I wouldn't suggest skipping anything as they build upon each other. There is ample practice, so you could skip a skill if your child has mastered the concept, but I really think practice makes perfect and it would be best to follow the provided schedule. You can, of course, keep practicing and take a more slow approach as we have had to do. There are NO hidden fees. You get your package, and it contains everything you need except plain notebook paper and the writing utensils. You get the DVDs, Binder/case for the DVDs, binders, student handout pages, dividers, and instructions for putting it all together. The deluxe package is great, and I received a code that unlocked a year's worth of goodies, too! This does cover multiple grade ranges, so it is long lasting. I'll be 100% honest, when I first popped in the DVD I really thought Mr. B would be bored. But, he wasn't! Andrew Pudewa must possess some sort of magical kid quality because he captivates your attention, and really encourages your child to WANT to learn and WANT to do well! The lessons are not terribly long, you can pause the video if needed for sensory breaks, and Mr. Pudewa is funny and really gets on the child's level. All of that works together to make the program really good for kids. The handout topics are pretty varied, so those may or may not touch upon a topic you are currently covering. BUT, writing ALWAYS ties in with other subjects. We carried the lessons over into other subjects by locating the key words in writings/passages, reworking sentences with the "which" clause, editing and proofreading, etc. Overall, WE LOVE IT! It is a great program for special needs and all learning styles. Mr. Pudewa really gets on the child's level and makes the learning process fun and low stress. The Institute for Excellence in Writing (IEW) has a special place in their hearts for special needs, and it shows with this product. They don't downplay the writing process, or "dumb" it down at all, which, as a special needs parent you totally get where I'm coming from there! There is nothing more frustrating than wanting your child to reach his/her full potential, grabbing a product that is designed for "special needs" and it is on a grade level ages below, or leaves out stuff that the product for a "typical" learner would have included. IEW does NOT do this! This is the same product for typicals as well as special needs, but it is presented in such a way that ALL can learn and benefit from it. I know I have mentioned my son's struggles with getting is thoughts from his brain to the paper. IEW breaks the writing process down into smaller steps, and it shows kids like mine how to save those brain ideas and get them on the paper. The keywords, underlining, allowing for proofreading and corrections, and calm environment all work to make this possible. MY SON WROTE A PARAGRAPH PEOPLE! HE WROTE A PARAGRAPH! He did something I honestly didn't think he'd ever do! MR. B wrote a PARAGRAPH! This is more than a language arts curriculum, it is more than a writing program....it is a life changer for us! I want to shout it from the hills, HE WROTE A PARAGRAPH! I realize I have made the student portion of the package the focus of this review, and for that I do apologize. I have just been so blown away by the progress Mr. B has shown in his writing, that I am overjoyed and want to share it with the world! The Parent portion is just as great, and just as important. The DVD course and materials take the stress, frustration, and apprehension out of teaching writing (especially teaching it to your Aspie or ASDer). I do not want to downplay the importance of the parent aspect at all! If you click the banner below, several of my fellow crew members have gone into great detail on "Teaching Writing: Structure and Style." So PLEASE click below and go see what they have to say about that, and several other FANTASTIC, WONDERFUL Institute of Excellence in Writing products (Like Level B, Fix in Grammar, etc.) 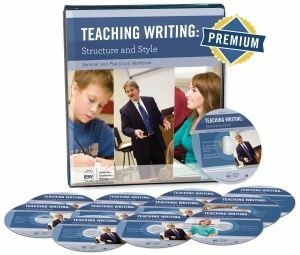 Teaching Writing: Structure and Style is a GREAT addition to your Student Writing Intensive Level A (or any of the student packages) It is 12 disks that show you how to teach your child. The first 9 are workshops that really get into the how's of teaching. The last 3 are over 5 hours of Anthony Pudewa teaching kids on 4 different learning levels. There is a binder with pages and pages of teaching tips and resources such as student page samples, and more. I found this particularly helpful because the student pages provided a sort of measuring stick for me. The workshop DVDs were so beneficial to me! I've struggled to teach Mr. B a subject that I have always found so easy. My college thesis was 32 pages! The topic? Social interaction in virtual worlds such as World of Warcraft! I have always loved writing, so teaching it to someone who hasn't loved it as much has been hard. This course takes that difficulty away, and for that I'm so grateful! The premium code I mentioned above unlocks 1 year of lecture videos and PDFs used to teach the various levels of IEW writing, and has proven it's worth for us time and again. So PLEASE check out the other reviews of IEW by clicking below! I loved reading your review! I can feel your excitement about this curriculum coming through your post. =) I'm absolutely ecstatic about IEW too!! Very impressed with both the teacher's course and the student's course. 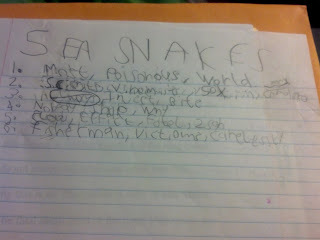 I love that my son loves writing now! What a difference this product has made in our home!!! Thanks! I am so happy! I was so worried he'd never learn to write!